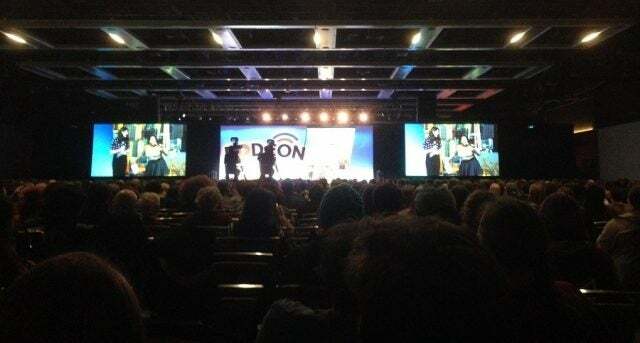 The second annual PodCon, a convention for podcasters and their fans, took place in Seattle over the weekend. The event still embodied the scrappy underdog on its second outing: It’s one of the smaller cons compared to those for comic books or YouTubers, and attendance didn’t appear to have grown much since last year. It’s a feat of crowdfunding, underwritten by an IndieGoGo campaign whose goal it didn’t quite hit – it reached 99% of its $300,000 goal, up from 81% its first year. But it all ran smoothly, with a raft of panels for aspiring podcasters offered alongside live shows and meet-and-greets for popular podcasts like My Brother, My Brother and Me and Punch Up the Jam. The convention is fascinating not for its size, but for the future it represents. Podcasting might be the most promising media industry of 2019. First, it’s growing steadily but surely: 26% of Americans have listened to a podcast in the last month in 2018, up from 24% in 2017, and 12% in 2013. Plus, the format is intimate, with hosts speaking directly into their listeners’ ears, and advertisements’ rate of success reflects this. Most importantly, it’s only just beginning. In terms of actual dollars earned industry-wide, podcasting is a baby, earning just $314 million in 2017 compared to the $17.6 billion in commercial radio spend or the $22.8 billion earned by internet search ads that same year. In theory, podcasting could capture billions more in ad money over the next few decades, and it’s that kind of massive growth that winds up shaping an industry’s entire culture. So, podcasting is at an exciting time. Or a scary one, if you’re a pessimist about the impact of terraforming a new industry on its most vulnerable occupants. The internet-era tech industry, which has sprung up just over the past 20-odd years, grew without much forethought, and turned out pretty morally questionable. Some have noted a few similarities between robber barons of the past and the tech CEOs of today, and a couple of the largest stories over the past year include Facebook profiting for years by sloughing users’ personal data off on third-party apps, and Google’s employees staging an international walkout last November to protest the company’s handling of sexual harassment. Despite its youth, podcasting has its share of familiar offenses. Multiple sexual harassment allegations in audio content industries from the last two years include award-winning broadcast and radio journalist John Hockenberry and NPR senior vice president for news Michael Oreskes. 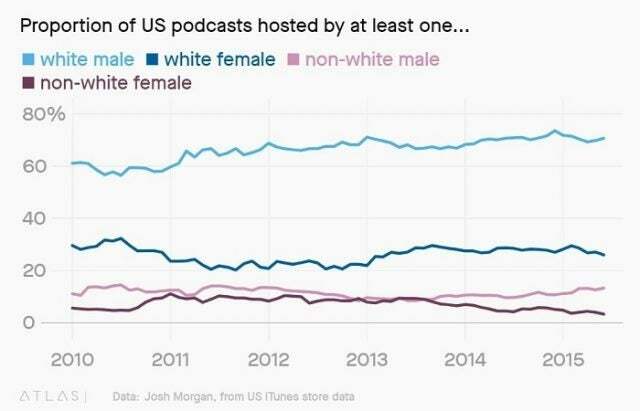 According to one sample from Josh Morgan at Quartz, 66% of American podcasts had a white male host in 2016, while just 18% had a non-white host at all. Recent restructuring in the industry may have also hit people of color harder than others, with Buzzfeed shuttering several podcasts in late 2018 that included the American Muslim-centric See Something Say Something and the women-of-color-led Another Round, which discussed gender and race issues. At any rate, my point here shouldn’t be that tough to comprehend: The systemic issues of racism and sexism extend to the podcasting industry just as easily as they do any other industry. But PodCon, amid its dual focus on fandoms and professional creators, is working to help give minorities a foot up and a step closer to the parity they deserve. Inclusivity was and remains a focus at both PodCon events. Featured guests included women, people of color, and queer individuals, and the same diversity extended to the audience and the topics addressed. Panels were dedicated to comedians with mental illnesses, finding your voice as a queer creator, keeping RPG podcasts accessible, and transgender representation in audio drama. One of the oft-quoted truisms about podcasting is that it’s easy for everyone to get into: You just need a mic and a mouth. One editing workshop led by Griffin McElroy confirmed this, when the well-established podcaster revealed his “dark secret”: He still uses the free program Audacity to edit his weekly three-podcast workload. Granted, it’s easy to make a podcast, but it’s hard to make a good one. 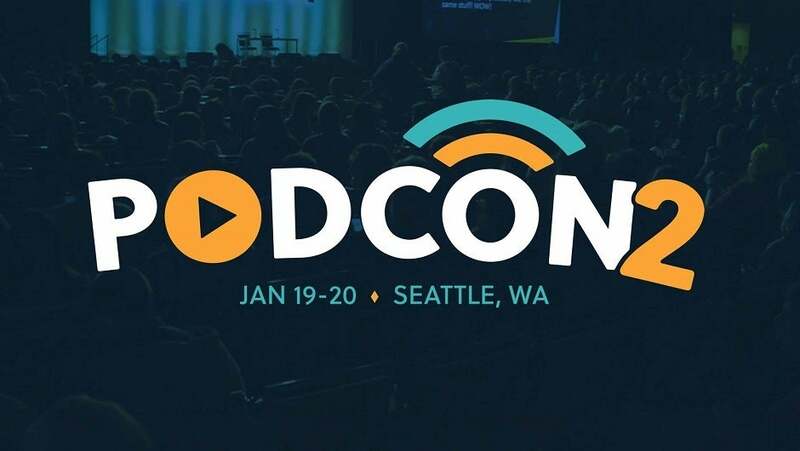 The best events at PodCon 2019 offer their attendees practical, actionable advice, whether through Griffin’s on-screen editing process (pro tip: The Snowball and Yeti mics are great for podcast newbies) or through “The Great Podcast Subject Swap,” a panel for people to swap their podcast ideas with people who could turn them into reality (top ideas included a Sports Twitter drama podcast and a spooky musical fiction one). In an industry with a low barrier to entry but a poor track record for minority groups, PodCon’s tactics of listening and offering support can make a meaningful difference. Several minutes of the transgender representation panel covered the panelists’ experiences with imposter syndrome. The conclusion? Differences are worth celebrating, everyone’s story is a little different, and the most important thing is to make sure everyone has a seat at the table. It’s always been true that we’re constantly shaping our industries’ moral codes, but few have pointed this out as bluntly as PodCon, and even fewer have taken any practical steps. Podcasting as a broader industry might be facing the same systemic problems found in every other tech industry, but PodCon is clearing a spot at the table that could keep the industry more inclusive in the future, as well as the present.